It’s great that you’re probably handy around the house, but there are some tasks that might be better left for the professionals. It’s great that you’re probably handy around the house, but there are some tasks that might be better left for the professionals. This is especially true for plumbing work. Sometimes even our best efforts aren’t enough to get the job done, or we end up making a bad situation worse with our own remedies. Homeowners don’t always have the proper training or access to the right set of tools to get the job done right and efficiently. Here are some signs to help you know when you can handle it and when it’s time to call a professional plumber. Clogs are a nuisance that all homeowners have dealt with at some point. There are many products on the market that can help relieve this situation, but if it seems to be a consistent recurrence then it’s probably time to call the plumber. A consistent clog in the same place or simultaneous clogs in various locations are signs of a larger problem. You might be dealing with a clogged sewer line or you might require a drain cleaning service to get everything flowing again. Low water pressure in your sinks or shower could mean that you have to make a call to your water supply company or municipality. This call will give you more information and let you know if it stems from an issue they’re having or if it’s more localized. The low water pressure could mean that you have a blockage somewhere in your plumbing or a pipe leak. 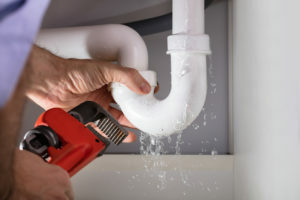 Speaking of leaks, it’s often difficult for homeowners to find the source of a leak without professional assistance and equipment. Leaks should be addressed as quickly as possible as they leave your home susceptible to water damage, mold, and an increase in your bills. Dealing with a sewage backup is dangerous and should only be addressed by professionals. If you’re smelling a strange smell of sewage in your home, you should call your plumber immediately. Avoid any standing water or puddles as they could contain toxic and hazardous waste materials. This entry was posted on Friday, April 12th, 2019 at 2:50 pm. Both comments and pings are currently closed.